Many programs allow one to boot an operating system from a USB; however, with the advent of UEFI BIOS options, some of the older formats of USBs are not as readily bootable on newer machines as before. Therefore, an additional program is needed for users to have a higher degree of compatability between booting operating systems from older USB drives on newer machines. 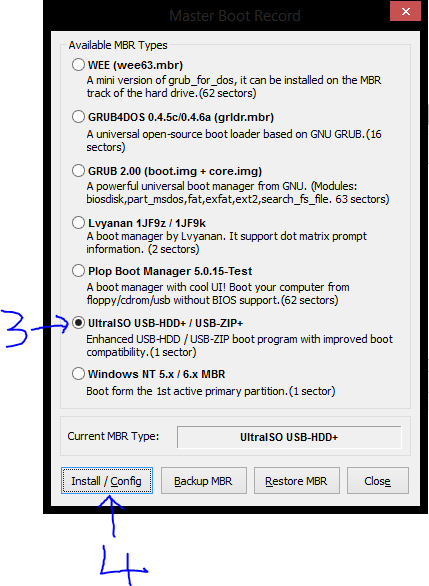 Bootice allows users to install a new Master Boot Record (commonly called an MBR) onto the USB so that it is seen by the BIOS as a device that can have bootable data. While the images on the site are all in Chinese, the program does down in English. Choose the appropriate device in the “Destination Disk” dropdown menu. In the new dialogue box, click on the “UltraISO USB-HDD+” button. 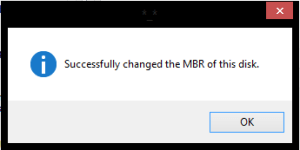 Once you have seen the “Successfully changed the MBR of this disk” message box, you have successfully completed installing a new MBR onto your USB.